I AM TERRIBLE at remembering names. Funny - I can remember Who lyrics from a gazillion years ago, or Van Halen's forgotten singer, or the Stanley Cup Finals MVP in 1979, but come up to me and say hello and say, "Remember me?" I do. 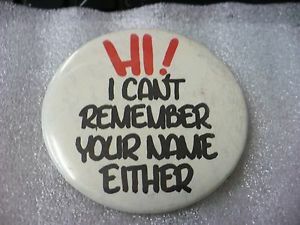 I just don't remember your name. This is hereditary. On the long and dreaded drive to the Hart cottage in the 1970s, we'd start acting up and my father would get mad. "Rod! I mean, Charys! I mean, Kathy! Stephen? No. Greg. Be quiet!" He'd run through all five names, figuring he'd get one right. I used to be offended. Now I'm just sympathetic. Sheryl has this issue, too. Yesterday she called our vet and said she needed flea medication for Bella. BELLA! You know, Bella The Destroyer, who's been dead and gone for a long time. I call Tucker "Angus" and Angus "Genie" and Josie "Tucker". See? It's a big vicious pet cycle, from what I vaguely remember. I have a lot of guitar students right now. Yesterday I called Lauren by the wrong name, Katie. It seems Katie comes about an hour later. So I was either jumping forward, or couldn't remember, or just blurted out the first name that came to my mind. I hope Lauren was not too offended. It's just the big dumb guitar teacher, but still, your name is your name and you would think he'd be better at remembering. Thank you for your patience and reminding me about your name. I appreciate it. I will make a mental note and lodge it into the deep recesses of my brain, back by our phone number in Montreal (471-8389) and the address of the house I lived in on Burton Street one long summer 32 years ago (830). Please don't be mad when I can't dig your name out. Kind of murky and muddy in there, if you know what I mean.